County Cork in Ireland, the home of Roy Keane and rugged coastlines, has a new claim to fame: it’s now a gastronomic hotspot. The 2019 Michelin guide for Great Britain and Ireland includes three Cork restaurants in a list of new entries published this week. Ichigo Ichie in Cork city, Mews in the village of Baltimore, and Chestnut in the hamlet of Ballydehob won the honours at a ceremony in London that recognised their chefs’ talents and the region’s bountiful produce. There is, however, an additional ingredient in Cork’s culinary triumph: hippies. West Cork was part of the hippy trail which drew artists and wanderers from around the world in the 60s and 70s. Some stayed and learned to farm, fish and cook, kickstarting a gourmet revolution. “They were into natural ingredients, self-sustaining lifestyles and and organic agriculture before it was ever a term,” said Robert Collender, the co-owner of Mews, a seasonal restaurant which uses only local produce. The head chef, Ahmet Dede, is from Turkey. The tasting menu at Mews includes Sherkin Island oyster, wakame and wood sorrel, plus smoked mackerel, kombu, parsley and wild fennel. Local chefs, successors to the earlier influx who learned to harvest one of the world’s great natural larders, climb cliffs, wade into the sea and kayak to forage for herbs, seaweed and other edible ingredients, said Helen Collins, chair of A Taste of West Cork, an annual food festival. Rob Krawczyk, 41, the chef who owns and runs Chestnut, grew up in Cork and learned about food from his father, an immigrant from Britain with Polish heritage who is a master of charcuterie. “My dad does a lot of sourcing for me. The produce is just second to none,” he said. Chestnut’s starters include brill with cauliflower, ink and parsley. Dessert is brambles with yogurt and clove sorbet or strawberries, lovage and goat’s cheese. Cork’s culinary fame bloomed in the 70s. Three restaurants won Michelin stars and chefs such as Myrtle Allen acquired devoted followers. Dublin then eclipsed Cork as a foodie destination and the rebel county ebbed as a culinary force until a new influx of chefs and restaurateurs, Irish and foreign, who learned their craft around the world, said Ryan. Standing by his chopping table in Ichigo Ichie, in Cork city, Takashi Miyazaki said he travelled around Ireland a decade ago seeking a location to set up a restaurant and chose Cork because of the freshness and variety of ingredients and because it reminded him of Fukuoka, his coastal home in Japan. 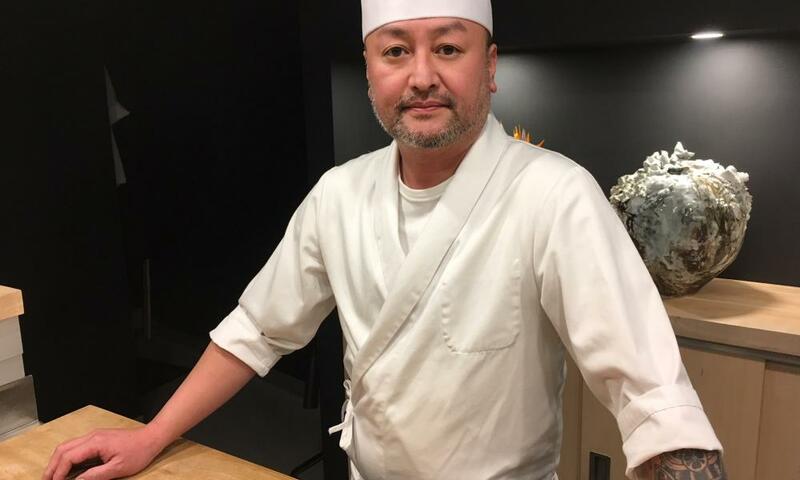 Irish people told him they loved Japanese food but were eating “plastic sushi”, deepening his resolve to create proper Japanese cuisine, he said. Ichigo Ichie, which translates as “once in a lifetime”, opened five months ago. It seats 25 diners in a dimly lit, spartan setting. It is fully booked until January. The Michelin star has delighted his suppliers. “You’re a legend, boy!” one exulted. The restaurant offers a no-choice kaiseski, a tasting menu of 12 courses, for €95. Dishes include nankin tsuki usagi – pumpkin, pumpkin seeds, satsuma autumn mikan and sweet potato, and kamo nanban soba – Thornhill duck, buckwheat, negi, hay leek and soba.